The system is designed to allow you to extend the capacity by simply adding extension boards onto it. This gives you the cost advantage when you are implementing minor capamcity upgrades. Moreover, the extension board based design provides a consistent architecture in the system and thus promotes better maintenance quality by reducing the system learning time. The cables are terminated in the controller. This allows faster data processing as transfer of data are all done onboard and the readers are directly connected to the controller. Centralised connection also promotes better deployment and maintenance quality. The engineers can perform the inspection and service all at one place and this can help to reduce the cost of maintenance operations. Where remote interfacing of door / reader or I/O are required, the controller supports these remote interfacing modules (RIM) that connect to the controller using RS485. This is a flexible and powerful controller capability that gives you the benefit of both useful centralized and distributed architecture in one box. The controller has been built for high end integrated security applications. It can support door access control, car park access control, lift access control and alarm monitoring. 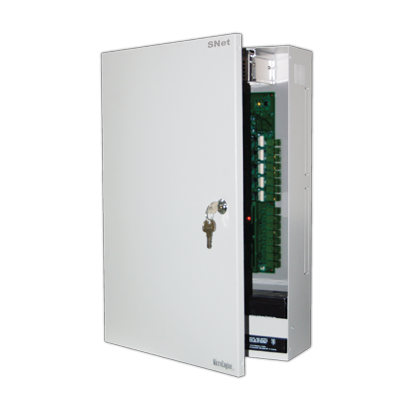 You can configure the capacity of the system by adding extension boards or remote interfacing modules. The controller uses the 32bit ARM RISC processor at 72MHz. This is a powerful processor for industrial applications and it enables the system to process the complex applications in real-time manner. The controller is equipped with LAN connectivity at 10/100Base-T using TCP/IP protocol. It supports push based communication to computer for faster data transfer speed. The IP communication is encrypted using industrial standard AES128 for secured communication. Firmware can be downloaded from the application software via the IP interfac. This helps to improve the maintainability of the controller at site. You can update or upgrade the firmware from the computer at site without needing to open the controller box or bring the controller back for service.